Controls enable you to prompt users for a parameter value. When you create a parameter as part of a report or graph, HTML Composer automatically adds a control, Submit button, and Reset button for the parameter to your layout. The parameter appears on the Parameters tab. You can also add an input control and bind it to a parameter. When you delete a parameter in Report Painter that was assigned a control in HTML Composer, you must delete the associated controls individually in the layout. A dynamic list retrieves values from a specified data source when the request is run. A static list consists of a list of values you supply. These values do not change unless you change them. An active report control lists active report values that mimic active report menu items. The active report controls cannot be associated to any parameters in the layout. This type of control can only be associated with an active report in the layout. The properties of a control, as well as the parameters associated with each control, can be controlled with the Properties tab of the Properties window, and with the Parameters tab. For details, see Working With the Properties Window and Working With the Parameters Tab, respectively. Note: Pertaining to the Default selection property, at run time, when using a combo box, there must be a value selected. In order to have nothing selected, you must add the Make selection value. For details about static and dynamic controls, see Creating a Static List of Values and Creating a Dynamic List of Values. For details about active controls, see Creating Active Technologies Dashboards With HTML Composer. When a report contains one or more new amper variable parameters created in Report Painter, the New Parameters dialog box appears when you save the report. You can set the Control Type for each parameter prior to returning to HTML Composer. This eliminates the need to select each parameter individually to set the associated Control Type. Note: When referencing or importing an existing report that uses a Master File containing a parameter, the Add “ALL” option and the Add “No Selection” option are unavailable. If linking hyperlink properties to another page or procedure, HTML Composer parses the other file for unresolved parameters and opens the New Parameters dialog box. The following image shows the New Parameters dialog box. For each parameter, you will find Name and Control Type fields, a Create control check box, and a Chain control check box. The Control Type ellipsis button enables you to select a new or existing control type for the parameter. The Parameter grouping options menu in the New Parameters dialog box provides options for the placement of the controls associated with new amper variable parameters created in Report Painter. The option selected is set from the HTML Page tab, which is located in the Developer Studio Options dialog box. You may create a single or multiple layer form, or select an existing form from the layout. Select Do not create a form to insert the controls for each of the new parameters in separate locations on the HTML page. Select New multiple layer form to insert the controls for all of the new parameters inside one form element you can position anywhere on the HTML page. This form element also contains submit (run) and reset buttons. The multiple layer form contains group boxes around each element in the form. You may move and resize each element of the control. Select New single layer form to insert the controls for all of the new parameters inside one form element, which you can position anywhere on the HTML page. This form element also contains submit (run) and reset buttons. The single layer form contains all of the elements within a single group box. Single layer is the default form type selected in the HTML Page tab. To change the default form type, select Options from the Window menu. The Developer Studio Options dialog box will open. From the Developer Studio Options dialog box, select the HTML Page tab. Select form(n), where n is the number of a control that already exists in the layout. The parameter is added to the selected control. Select Don't show this message again and use default selection to control whether or not the New Parameters dialog box appears when adding parameters in HTML Composer. Tip: You may view the New Parameters dialog box again by selecting Show New Parameters dialog from the HTML Page tab. To access the HTML Page tab, select Options from the Window menu. The Developer Studio Options dialog box will open. From the Developer Studio Options dialog box, select the HTML Page tab. 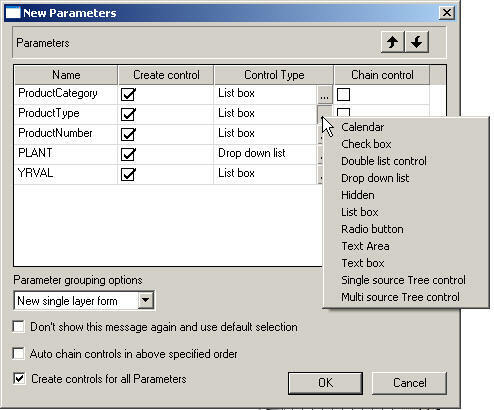 Select Auto chain controls in above specified order to automatically chain the selected controls from the New Parameters dialog box. The auto chain option is useful since it creates the chain, or links of a chain, automatically for the parameters selected in the Chain control column. For more information, see Automatically Chaining Parameters From the New Parameters Dialog Box. Select Create controls for all Parameters to switch between creating controls for all or none of the parameters in the New Parameters dialog box. When importing or referencing a report with parameters to an HTML page, all of the controls will have Create control selected by default. The create controls for all parameters selection is useful when there is a long list of parameters that you do not want to add controls for on the HTML page. To edit the Control Type that you selected from the New Parameters dialog box, select the parameter object on the Parameters tab or the Design tab, right-click, and select the control type option from the Set Control Type menu. When you create a parameter as part of a report or graph, HTML Composer automatically adds a control, Submit button, and Reset button for the parameter to your layout. Manually adding a control to the layout enables you to create the individual objects on the control. Inserting a control in the Design view creates the control object in the layout with the Submit button and Reset button. You must manually add the input controls to be used in the control. For more information, see Using Controls to Supply Incoming Parameter Values. Click the Insert form button from the Components toolbar. You may select Multiple Layer Form or Single Layer Form as the form type. If no form type is selected, single layer form is the default. From the Insert menu, point to Components, then point to Form, then select a form type (Multiple Layer Form or Single Layer Form). To change the default form type, select Options from the Window menu. The Developer Studio Options dialog box opens. From the Developer Studio Options dialog box, select the HTML Page tab. The multiple layer form contains group boxes around each element in the form. You may move and resize each element of the control. The single layer form contains all of the elements within a single group box. Drag the crosshair to create a control and adjust it to the size you want. A control is created in the layout and assigned the form(n), where n is a number. You may add input controls in the control object to create parameter values. Create an insert control and add it in the control object. For example, insert a List Box, Drop Down List, and so on. Click the Parameters tab to create parameter values. The Properties and settings dialog box opens. Creating an input control from the Design view prompts you to create a bound parameter on the Parameters tab. Create the parameter values for the input control. For details about creating parameter values, see Creating Parameter Values. Optionally, you may close the Properties and settings dialog box for the input control if you wish to bind a parameter to a control. Bind the input controls to a parameter. Binding a control to a parameter will populate the parameter. Drag a control object to a parameter object on the Parameters tab. For details about creating input controls, see Using Input Controls to Supply Parameter Values. Optionally, you may assign hyperlink properties to the Submit button. For more information, see How to Add a Hyperlink to a Push Button or an Image. In the Parameters tab or the Design tab, select the input control associated with the parameter name. Right-click and select Set Control Type. Select the type of input control for the form. 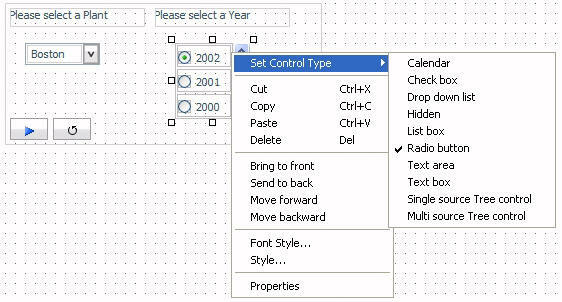 Options are Calendar, Check box, Drop down list, Hidden, List box, Radio button, Text area, Text box, Single source Tree control, and Multi source Tree control. The following image shows the input control options when right-clicking a control object on the Design tab. When a control is automatically added to the layout with the New Parameters dialog box, it is associated (bound) to a parameter. Click the Parameters tab and notice the direction of the arrow. The control object is bound to the parameter object, which means that the control will populate the parameter. If you deselect the Create control option from the New Parameters dialog box, the deselected parameter name is added to the Unbound Parameters box on the Parameters tab. The Unbound Parameters box is a container for the unbound parameters, only for parameters not selected from the New Parameters dialog box. Any parameters created or unbound from the Parameters tab are not automatically moved here. Optionally, you may click and drag parameters to and from the Unbound Parameters box for your own organization. Select the arrow head on the line between the parameter and the input control, so that the line is bold. Right-click and select Break binding. Select the center of the input control object. Click and drag the control to the center of the parameter object. Release the mouse to complete the binding. Controls can be single-select or multiselect. Single-select controls enable you to select a single value from a list of supplied values. Multiselect forms enable you to select multiple values from a list of supplied values. A text box. For details, see Using a Text Box. A drop-down list. For details, see Using a Drop-Down List. Radio buttons. For details, see Using Radio Buttons. A text area. For details, see Using a Text Area. Check boxes. For details, see Using Check Boxes. A list box. For details, see Using a List Box. A tree control. For details, see Using Tree Controls. A drop-down list is the default control type for all single-select parameters on the New Parameters dialog box. A list box is the default control type for all multi-select parameters on the New Parameters dialog box. You can change the type of input control using the Parameters tab. For details, see How to Change the Type of Control Associated With a Parameter. Note: Individual multiselect parameters must be designated as multiselect in Report Painter in order to process multiple values. When creating parameters, the Grouping option selected in the New Parameters dialog box generates a container for controls. After the container is created, you may choose to delete the container by using the Delete Container Only option. This option allows you to delete the container without deleting the objects inside. You can Delete Container Only using the Edit menu, by using the Ctrl + Delete keys, or by right-clicking the container and selecting Delete Container Only from the context menu. The following image shows the Delete Container Only option on the Edit menu. The following image shows the Delete Container Only option on the context menu when right-clicking a container. Note: If you delete a form container, the Reset button is deleted with the form. The Reset button is deleted because it is attached to the form.